Advanced SystemCare Ultimate 7 is the best solution for optimizing your computer performance with rich features. This maintenance suite is combined with packed set of tools including protection, performance, privacy and of course free 24x7 technical support. It incorporates all security features and accomplishes the task perfectly. Advanced SystemCare Ultimate combines the power of Bitdefender antivirus engine and the IObit malware engine, and gives you the real-time protection against viruses and spyware affecting your computer. Advanced SystemCare Ultimate 7’s dual security engine can create potential conflicts if you have previously installed some other antivirus tool on your computer. Conversely, you can install in a “Compatibility mode”, which plunges the real-time defense to lessen the probability of issues. It is recommended not to install other antivirus tool, as Advanced SystemCare Ultimate offers full-featured solution to every problem on your system. Advanced SystemCare Ultimate 7.0.1 is the newest version released on Dec, 2013 which have added some new features and improved some other. Advanced SystemCare Ultimate 7 can be bought only for $29.99/1 yr for 3PCs. You will get a 30-day trial if you install the trial version. After 30 days, you can register with a valid license/serial. To install the program, you need minimum 512 MB of RAM and 800 MHz processor. You can select quick, full and custom scan for detecting threats in your computer. When you enable “Silent Mode”, the scanning module, unnecessary notifications, etc. are put out of action. The Silent mode should be enabled only while you are playing games. You can even set the silent mode in automatic mode. Clean – ManageMyMobile, IObit Uninstaller, Registry Cleaner, Disk Cleaner and File Shredder. 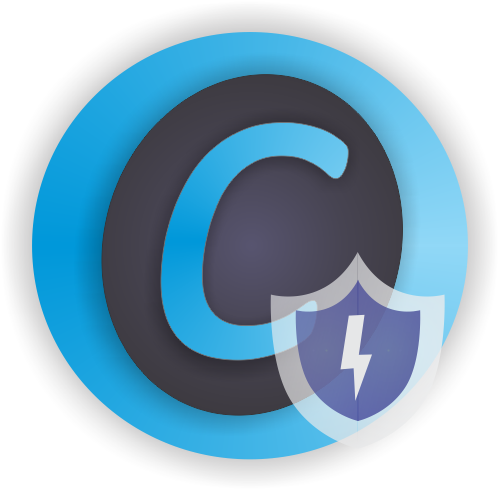 Security – Driver Booster, Homepage Protection, SysExplorer, Process Manager, Driver Manager and IObit Unlocker. 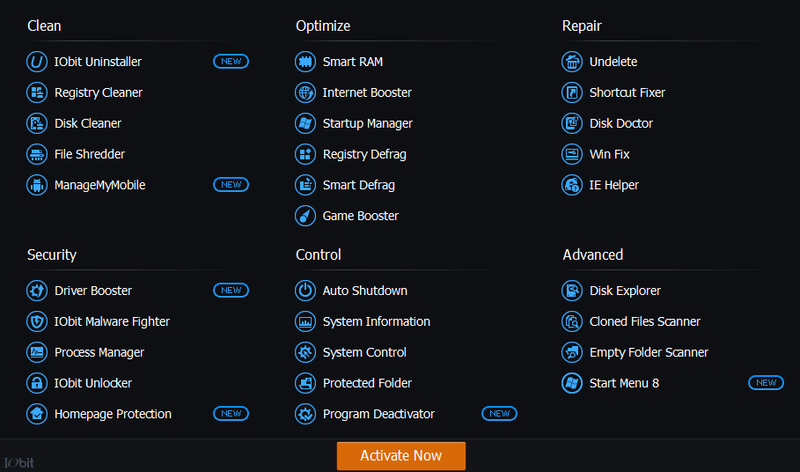 Optimization – Smart RAM, Internet Booster, Startup Manager, Registry Defrag, Smart Defrag and Game Booster. Controls – Program Deactivator, Protected Folder, Auto Shutdown, System Information and System Control. Repair – Undelete, Shortcut Fixer, Disk Doctor, Win Fix and IE Helper. Advanced – Start Menu 8, Disk Explorer, Cloned Files Scanner and Empty Folder Scanner. 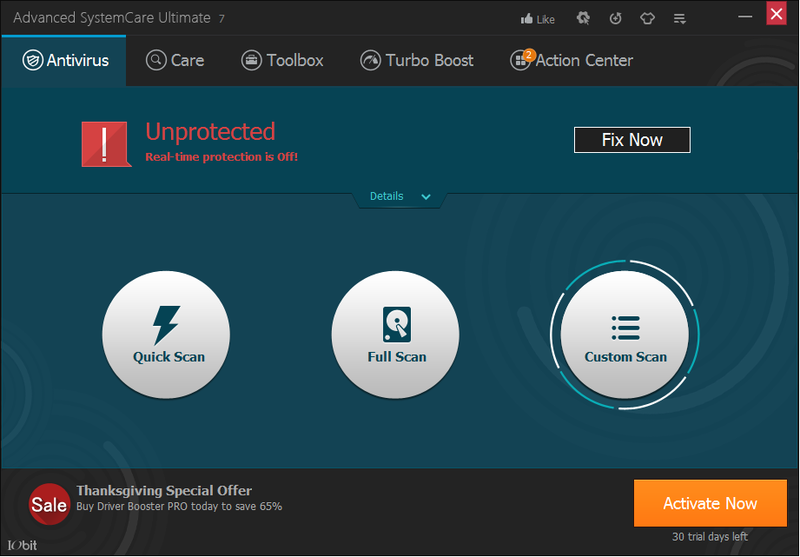 The toolbox clearly suggests Advanced SystemCare Ultimate 7 is a comprehensive solution for system protection, optimization and privacy protection. If you wish to optimize and speed up your computer, turn on “Turbo Boost” which automatically releases unnecessary RAM and stops services/apps. Overall, Advanced SystemCare Ultimate 7 takes your computer protection to a new level where you’ll be benefitted from improved performance and security. For those who are looking for complete security, Advanced SystemCare Ultimate 7 is a serious all-in-one security application at a reasonable price.